What's it about? 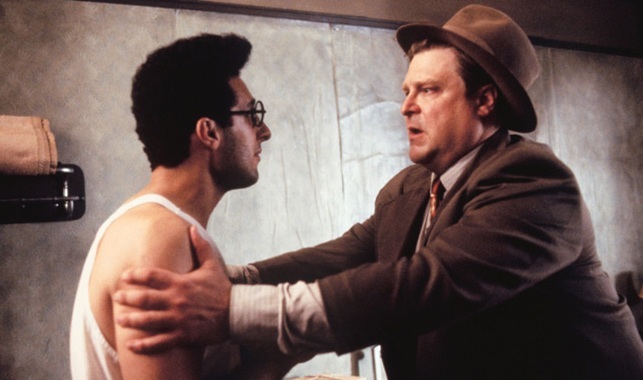 Idealistic New York playwright Barton Fink (John Turturro) moves to LA to write for the movies. He is immediately afflicted by writer's block, a situation not helped by the nightmarish environment of his seedy hotel and the constant interruptions by the enigmatic guest in the room next door (John Goodman). Is it any good? I'm not sure - this is a very odd affair altogether. Is it a comedy? A horror? A big joke by the Coens? All of the above? Who knows. Nevertheless, there are enjoyable moments of black comedy, Michael Lerner's Louis B Mayer impression is terrific fun (even if you don't know who that is) and it's all put together with considerable style. But the Coens absolutely refuse to go down a conventional plot pathway, meaning things all get a bit very weird and you'll most like end up scratching your head at the direction the story takes. You might regard this as refreshingly inventive or it could equally strike you as a film trying too hard to be completely offbeat, just for the hell of it. Either way, if you hate movies which don't explain everything at the end, you'll absolutely detest this.
" Barton! What the hell is this film about!?" I don't trust you. What do others think? It won the Palme d'Or at Cannes and critics raved about the unique-ness of it all, but it's probably telling that none of them could really agree on what it was all about. My other half watched it with me and turned an accusing eye upon me at the end accompanied by the withering comment 'You and your films'. I think she secretly liked it. The most accurate review probably comes from these two guys. Anything else I should know? Inspirations included Polanski's Repulsion, Kubrick's The Shining and Wilder's Sunset Boulevard. In fact, all of those are better movies, so just watch all of them first. But give Barton Fink a go, then come back and explain it to me. What does the Fonz think? I'm not sure, either. Probably one thumb up. What was in the box again?